TRENTON, NJ; May 22 – In recognition of National Preservation Month, Preservation New Jersey, Inc. (PNJ) today announced its 19th annual list of the 10 Most Endangered Historic Places in New Jersey. Detailed descriptions and local advocate contacts for this year’s listed places, below, are available at www.pnj10most.org. The 10 Most Endangered Historic Places program spotlights irreplaceable historic, architectural, cultural and archeological resources in New Jersey that are in imminent danger of being lost. Unique this year, the list includes 11 entries: 10 places, and one issue that endangers historic resources statewide. The act of listing these resources acknowledges their importance to the heritage of New Jersey and draws attention to the predicaments that endanger their survival and the survival of historic resources statewide. The list, generated from nominations by the public, aims to attract new perspectives and ideas to sites in desperate need of creative solutions. Several challenges face properties on this year’s endangered sites list, including neglect and deferred maintenance, vandalism, redevelopment proposals, and potentially damaging new legislation and regulations. The effects of an extraordinarily challenging economy remain evident, particularly in the wake of Superstorm Sandy: a dearth of funds, limited viable rehabilitation plans, and taxed municipal and state budgets are just a few of the difficult issues with which not only those sites on this year’s list, but historic properties throughout New Jersey, are currently grappling. 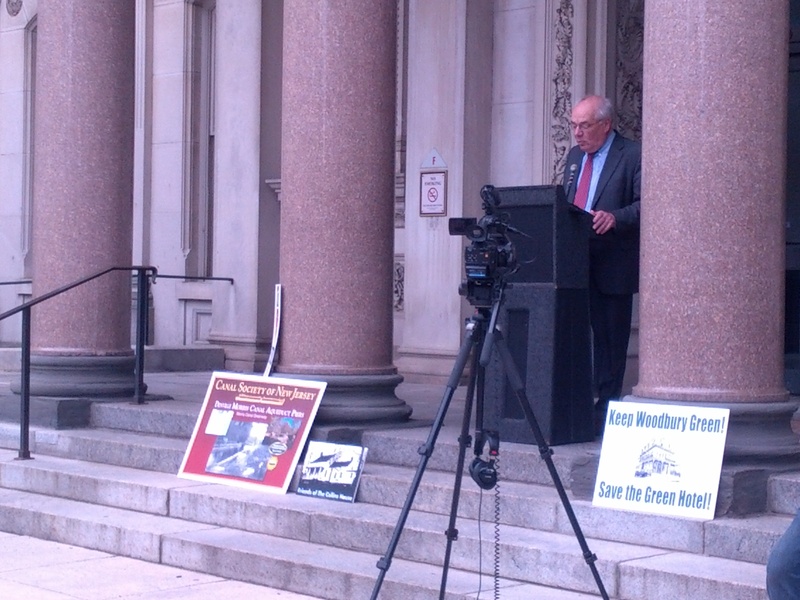 PNJ President David H. Knights announces this year’s list on the steps of the NJ State House. The state’s funding resource for historic preservation and open space and farmland conservation. 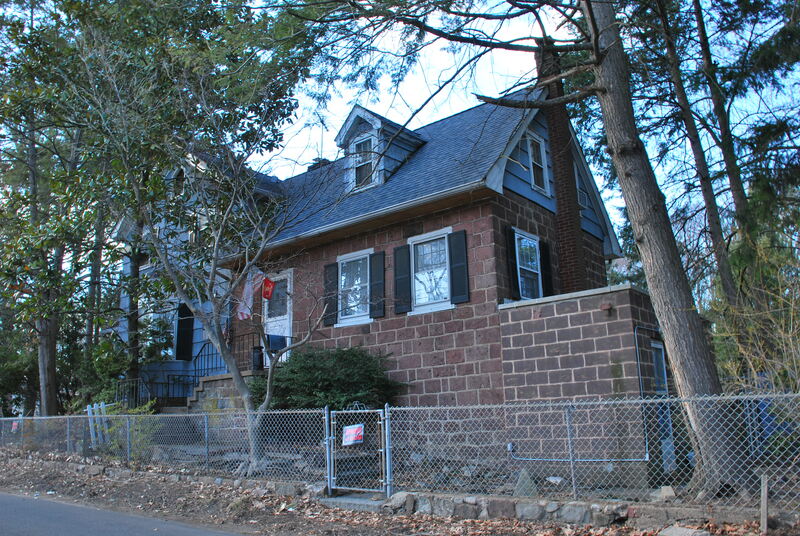 The programs supported by the GSPT, including the New Jersey Historic Trust’s grants for preservation, have run out of funds, endangering countless properties that could potentially be rehabilitated or restored with these grants, and rendering the need for a new funding source exceptionally desperate. The survival and integrity of storm-damaged historic places are now additionally threatened by new building codes and regulations, a myriad of recovery priorities on rushed timelines, and an overwhelming need for funding and technical assistance. An 18th century house associated with Bloomfield founders and the Morris Canal, currently vacant and threatened by deterioration and a lack of funding. Detailed descriptions and local advocate contacts for the places listed this year and in previous years can be accessed at http://www.pnj10most.org. Founded in 1978, Preservation New Jersey is a nonprofit organization that helps homeowners, organizations, public officials and citizen advocates working to preserve the historic neighborhoods and sites that are important to our communities. Preservation New Jersey produces this annual list of New Jersey’s 10 Most Endangered Historic Places in addition to other advocacy programs; provides educational workshops; publishes a monthly online newsletter, interactive website, and blog; serves as a resource for technical assistance and general advice for the public; and addresses legislation and public policies that impact New Jersey’s historic places and communities. Visit Preservation New Jersey’s websites at www.preservationnj.org and www.pnj10most.org for more information regarding the organization and the 10 Most Endangered program. For details about National Preservation Month, visit the National Trust for Historic Preservation’s website at www.preservationnation.org. It’s Earth Day again- a day to put our planet first by conserving water, turning the lights off when we leave a room, and reducing the amount of trash we create. Every year, millions of people worldwide celebrate Earth Day, which is a great thing. But as the old saying goes, Earth Day really should be every day. And more sustainable, environmentally-conscious living should encompass all aspects of our lives- especially our buildings. Sustainability is the nature of historic preservation. While preservationists still have a lot of work to do helping the general public, and in many cases, even building professionals, to “get” just how “green” preservation really is, it’s only common sense that historic preservation is the ultimate form of recycling. 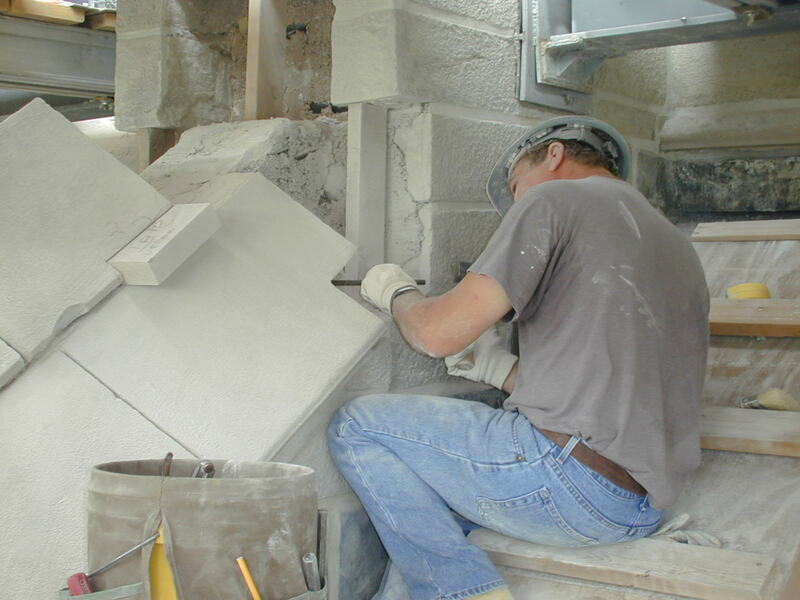 Rehabilitating old buildings not only reuses materials and keeps them out of landfills, but eliminates a majority of the energy consumption that the process of demolition, landfilling, the production of new materials, and new construction necessitates. Not to mention that older buildings were often designed and sited to take advantage of environmental factors such as sun, breezes, and elevation, all of which can still be useful in reducing energy consumption in today’s world of modern conveniences. There’s no question: the greenest building really is the one that’s already built. So as you recycle, reduce, and reuse this Earth Day, consider your built environment- how are are buildings you spend your day in contributing to the environment? If you’re in an older building, chances are, you’re subconsciously celebrating Earth Day everyday, just by being there. – This 2012 National Trust for Historic Preservation study concludes that, when comparing buildings of equivalent size and function, building reuse almost always offers environmental savings over demolition and new construction. – It’s true, buildings that were built before a time of air conditioning, high-voltage electronics, and modern insulation materials often need help being efficient. Check out this guide for tips on how to help older buildings better conserve energy. – Old windows are the most-maligned feature of historic properties. Yet while typical instinct says that older windows need to be replaced, a constantly-growing body of evidence suggests that replacing windows is one of the least green things a property owner can do. Check out the information above, and below, to learn why. – A 2012 study evidencing that saving historic windows saves not only energy, but money. Visit the PNJ Facebook page and tell us what recycled historic New Jersey building you’re spending time in this Earth Day! accounts and images of loss and devastation that are pouring out of the Garden State and its neighbors all along the east coast, but that doesn’t make them any easier to take. As for historic resources, the storm’s impact will take weeks to catalog, but thus far, is unsurprisingly varied. Cape May escaped largely unscathed, and in Wildwood Crest, landmarks like the Caribbean Motel report only very minor roof damage. On the other end of the spectrum, most everyone is aware by now that Seaside Heights’ historic boardwalk was literally obliterated, and the restored Jersey City Terminal in Liberty State Park was inundated with flood waters and winds that took out windows and destroyed exhibits. And with so many people still without electricity, reports from much of the state are slow in coming. With the help of the New Jersey Historic Preservation Office, PNJ has compiled a list of helpful resources for anyone dealing with the recovery needs of historic properties. Highlights include the National Trust for Historic Preservation‘s resources for homeowners, the Advisory Council on Historic Preservation‘s list of Federal-level financial assistance for historic preservation projects, and an array of sources of advice on the physical repair of damaged historic properties. As the shock of Sandy’s impact wears off, and the reality of recovery begins, we preservationists will have a lot of work to do. It will be up to all of us to remind those impacted and those in charge of recovery efforts that historic properties provide opportunities for retaining a community’s identity “before the storm,” that demolition is rarely cheaper than repair, that federal assistance triggers Section 106 review, and so on. Here at PNJ, New Jersey’s communities and their heritage are our reason for being– the unique sense of place that allows so many worldwide to identify with the loss we’re experiencing right now is the reason we do what we do. We believe that the visions people get when someone says “Atlantic City” or “Ellis Island” or “the Jersey shore,” and the completely unique environments and experiences places like these offer, are vital to our society, and must be protected. And while there is no preservation ordinance, no grant program, no amount of advocacy that can prevent disasters such as Hurricane Sandy and the damage they cause, there are countless daily, preventable threats to historic places that we can- and will- continue to address, with your help. Disasters like what we’ve just experienced will always take away irreplaceable historic resources. We can’t prevent these losses, but we can help to mitigate how much they take, both by getting involved and being proactive preservation advocates in the immediate aftermath, and ensuring the lessons learned translate into implementation of the best possible long-term disaster preparedness plans for our historic places. 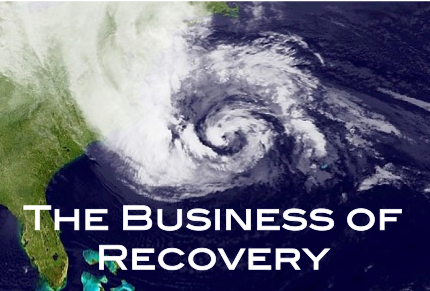 PNJ wishes New Jerseyans and everyone affected a speedy recovery from Hurricane Sandy, and stands ready to help however we can. We’re here for you, and the places you care about. Rehabilitation projects utilizing the Federal Historic Tax Credit may face a harder time attracting private investors , thanks to a Third Circuit Court of Appeals ruling handed down at the end of August. In November 2011, Preservation NJ joined the National Trust for Historic Preservation, the National Alliance of Preservation Commissions, the National Conference of State Historic Preservation Officers, AIA-New Jersey, and Preservation Pennsylvania, in filing an amicus brief in the Third Circuit Court, which was hearing the case of Boardwalk Hall in Atlantic City, on appeal from the U.S. Tax Court. 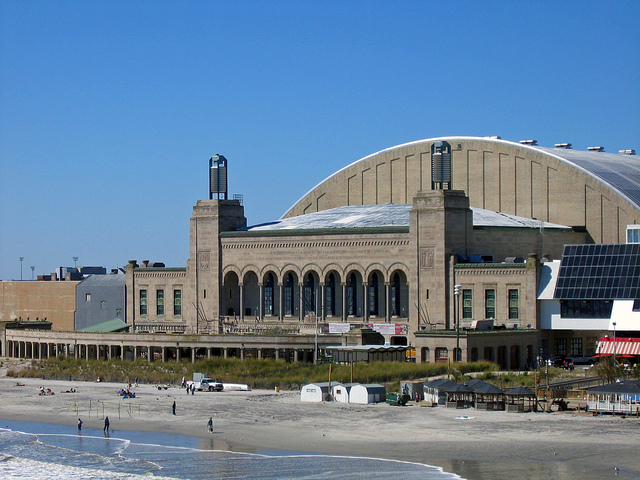 Boardwalk Hall, one of few historic resources left along the Atlantic City boardwalk and known nationwide as the birthplace of the Miss America pageant in 1921, was restored beginning in 2000 by the New Jersey Sports and Exposition Authority (NJSEA). In a commonly-used arrangement, a for-profit investor, in this case a subsidiary of Pitney-Bowes, invested $18 million in the project, and thereby became a percentage owner of the limited liability company that owned Boardwalk Hall, with NJSEA retaining the additional ownership. This fairly typical arrangement enabled the for-profit investor to take tax credits on the restoration of Boardwalk Hall- credits that are not applicable to the NJSEA, as a public entity. In this particular case, substantial measures were taken to both minimize the investor’s risk and ensure a return on their investment. The IRS later challenged these measures in court, claiming the the LLC formed by NJSEA and the investor was a sham, and while the U.S. Tax Court originally ruled that the structure was legitimate and acceptable, the IRS appealed, landing the case in the Third Circuit Court in 2011. In August, the Third Circuit Court overturned the U.S. Tax Court’ ruling. PNJ is working with our partners at Preservation Action and the National Trust to gain further clarity on the overall implications of this case and ruling on the Federal Historic Preservation Tax Credit. While many elements of this deal were what’s considered commonplace in the structuring of tax credit projects, there appear to have been some extraordinary arrangements that may mean this ruling has less of an impact on more typical tax credit projects than once feared. Regardless, it’s clear that the IRS, despite never having provided guidance on the subject, is now scrutinizing Federal Historic Preservation Tax Credit projects to an unprecedented degree. This could of course result in investor wariness to become involved in such projects- and historic buildings would end up paying the price. Preservation New Jersey will continue to keep you posted on this case and additional developments regarding the Federal Historic Tax Credit. For the Boardwalk Hall case, a petition for rehearing would be due by October 11. In this guest post was by construction management expert Noelle Hirsch, we highlight the debate-bordering-on-conflict between preservationists and construction policy-makers. PreserveNJ commented on new, more preservation-conscious LEED standards in 2008, but despite these improvements, the debate remains relevant as green building codes inspired by LEED threaten to retrofit historic buildings with green solutions that are unsympathetic to historic preservation standards. Noelle regularly writes for constructionmanagement.net, a resource for people interested in working and studying the construction management field. Construction Management in the 21st Century: Preserving History with LEED? sustainability advocates claim the U.S. Green Building Council’s LEED certification program represents a key component for solving efficiency problems in the U.S. Yet, as green building under the LEED program continues to expand, battles between sustainability advocates and historical preservationists may be inevitable. LEED is an acronym developed by the USGBC which stands for Leadership in Energy and Environmental Design. The concept behind LEED is to provide a framework for identifying and implementing practical and measurable green building designs, construction and maintenance. LEED committees use a checklist of various measurable criteria to ensure that new buildings maximize energy use. Since its inception, nearly 15,000 companies and organizations in 120 different countries have utilized the LEED program to reduce energy usage and encourage sustainability. While preservationists agree that sustainability is important, they argue that historic buildings should be retrofitted with their original plans rather than anachronistic modern designs. Long before LEED certification ever existed, preservationists argue, historic buildings were regularly built with sustainable features out of necessity. “When effectively restored, these features can bring about substantial energy savings,” according to the Whole Building Design Group (WBDG). “Taking into account historic building’s original climatic adaptations, today’s sustainable technology can supplement inherent sustainable features without compromising unique historic character.” The WBDG Historic Preservation Subcommittee argues for revising the current version of LEED to better account for the social values and environmental benefits of preserving historic structures. For buildings that carry historic value, proponents of LEED recommend using the LEED-EB certification for existing buildings. LEED-EB includes a checklist for maximizing the sustainable qualities of existing buildings that can be very effective, yet preservationists maintain that the certification has its oversights. Although LEED encourages concepts like tall, appropriately placed windows to utilize natural light and heat while avoiding mechanical air conditioning, preservationists argue that simple fixes like historically appropriate awnings, which are not featured in LEED’s checklist, can reduce overhead gain by 65% or more, without compromising historical accuracy. Few academics or preservationists will dispute the importance of energy-efficient building to save costs and maximize our limited resources. Yet, the importance of historic structures can also easily be overlooked in our haste to build for the future. Ingeniously developed architecture has existed for millennia, often in times and places where resources were scarce or difficult to attain. By embracing the tenets of LEED while maintaining the relevant architectural successes of the past, construction managers and architects have the best chance at developing truly innovative, sustainable structures. From PNJ: There’s lots more that can be said about LEED and historic preservation- what are your thoughts? As we preservationists are well-aware, there are a perilous few laws and regulations that have the oversight and teeth necessary to really save historic places. We exist in a world of private property rights and “highest and best use,” wherein the general public is increasingly disillusioned with government regulation, including that of the land use variety. For those of us who deal with these challenges daily, it is always a little surprising when, after preservation tragedies like July 13th’s loss of the 18th century Zabriskie Tenant House in Paramus, so many people repeatedly ask, “How could something like this happen?” But we preservationists must constantly remind ourselves how many people don’t really understand how historic places are “saved-” or how easily they can be lost. We make strides daily, but there is much education yet to be accomplished. The demolition of the Zabriskie Tenant House, a National Register of Historic Places-listed 18th century stone house that was the oldest surviving link with the thriving 19th century African-American community of Dunkerhook, came as heartbreak to area advocates, who had been working almost two years to save the building. 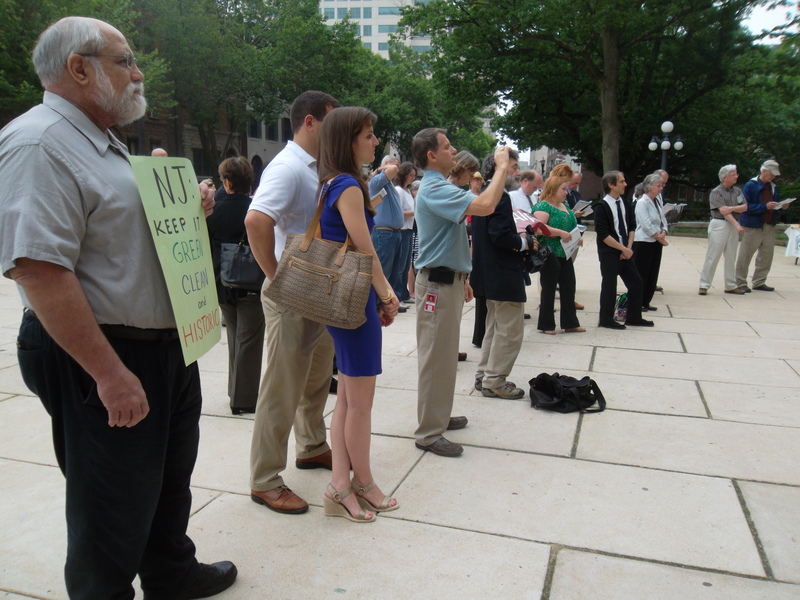 When an application for demolition was filed in 2010, a group of concerned citizens quickly mobilized. The advocates pointed out that the house was included on a list of local landmarks regulated by an ordinance that claims to establish a historic preservation commission in Paramus. Lesson #1: ANYONE can speak out and make a difference for a historic place. If citizens had not been alert in this case, and taken it upon themselves to do research and generate interest, the Zabriskie Tenant House could easily have been demolished without so much as a question. In most instances, historic preservation ordinances offer a measure of protection for historic resources. However, it would soon be revealed that the Paramus Historic Preservation Commission hadn’t actually had a member appointed in at least a decade, and the Planning Board that such a commission was supposed to advise was woefully inexperienced with historic preservation concerns. Lesson #2: Each and every building, community, and situation is different. In preservation, everything is case by case. On June 7th, PNJ moderated the wrap-up session for this year’s wildly-successful NJ Historic Preservation Conference. The session featured representatives of the NJ Keep It Green Campaign and staff of the New Jersey Historic Trust, who discussed the current status of Garden State Preservation Trust funding, and what the public can do to help ensure this tenuous funding’s long-term future. The Garden State Preservation Trust (GSPT) funds the New Jersey Historic Trust (NJHT), as well as the state’s Green Acres and farmland preservation programs, so without GSPT, we’d be without state-level historic preservation, open space, or farmland preservation grants. Why should this matter to all preservation devotees throughout New Jersey? Just check out the database of funded projects on the NJHT website for an idea. During the conference session, we asked everyone in the room who was associated with a project that has received any type of Garden State Preservation Trust funding to stand up. Out of approximately 200 people, over three fourths of the room rose. The NJHT is the most significant source of state-level funding for historic preservation in New Jersey, issuing 693 grants and helping to preserve 477 resources since 1990. This funding enables and incentivises non-profits and public entities to plan for and preserve historic places, creating jobs and leveraging imperative non-state matching investment along the way. NJHT funds have engendered success stories at such diverse sites as Paulsdale in Mount Laurel, the First Presbyterian Church of Elizabeth, the Hoff-Vanatta Farmstead in Harmony, and the Essex County Courthouse in Newark. The loss of this funding would leave a gaping hole in the preservation equation in New Jersey- countless potential future success stories would have nowhere to turn for financial assistance. Enter the NJ Keep It Green Campaign, a coalition of over 165 statewide, local, and regional groups, mostly conservation and environmental entities, working together to sustain and improve GSPT funding. NJ Keep It Green led successful campaigns to pass ballot measures in 2007 and 2009 that generated a combined $24 million for historic preservation funding in New Jersey- so they come with experience. But they also come with collective expertise, and are always looking to expand that expertise with added members. Preservation New Jersey is an active member of the coalition, along with the New Jersey History Advocates, AIA-New Jersey, the Monmouth County Historical Association the South Jersey Cultural Alliance, and more. The coalition is strengthening bonds between our state historic preservation and environmental communities, and keeping GSPT funding needs in the spotlight, particularly with our legislators and gubernatorial administration. Of course, a coalition is only as strong as its members. NJ Keep It Green needs your help to fight for long-term, sustainable funding for the Garden State Preservation Trust. You can join the campaign, volunteer, and contribute funds to help spread to word. Keep up to date by liking the campaign on Facebook- or become a member and get all the latest information e-mailed right to you! And talk to your legislators about the importance of this funding and the need for their support for replenishing funding in 2013. The NJHT recently undertook capital needs survey in an effort to document current historic preservation funding needs statewide. The study identified over $730 million in needs- so there is no doubt that there’s much work to be done. NJHT funding is imperative to the effort to address these needs, but it will be up to us to work to make sure this funding is a reality in the future.